Don't take chances when shipping liquefied petroleum gas. Put Labelmaster's UN 1075 Flammable Gas Placards to work. 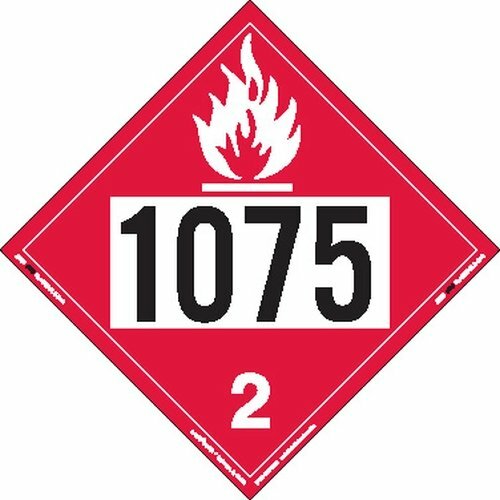 Pre-printed with the four-digit UN Number, these DOT placards are what you need for shipping liquefied petroleum gas and meeting the requirements of 49 CFR 172.500 for domestic and international shipments of hazardous materials by highway, rail and water. They are printed on super-tough rigid vinyl that is commonly used for multiple trips and in harsh weather conditions. Recommended for us in Slidemaster holders, these Hazard Class 2 placards measure 273 x 273mm and are sold in packs of 25 or cases of 500. View More In Industrial Label Makers. If you have any questions about this product by Labelmaster®, contact us by completing and submitting the form below. If you are looking for a specif part number, please include it with your message.